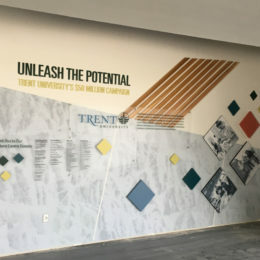 Established in 1964, Trent is one of Canada’s top universities and was founded on the ideal of interactive learning that’s personal, purposeful and transformative. 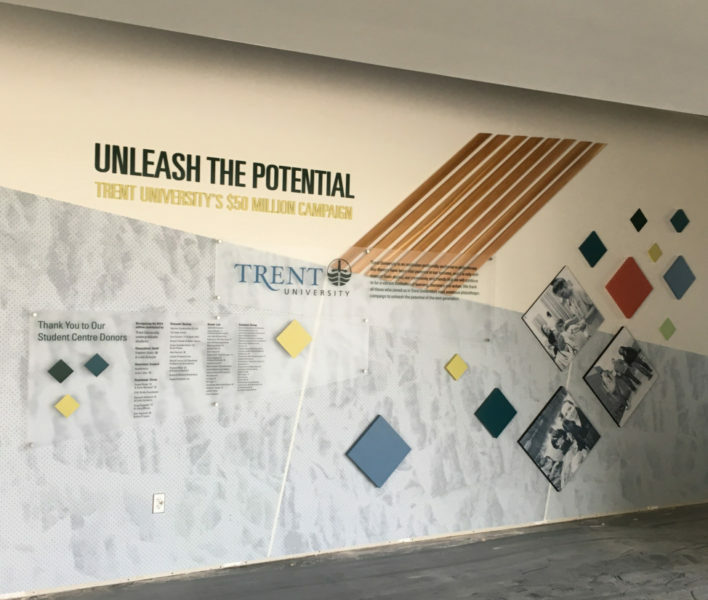 With this mandate, Trent University recently embarked on their $50M UNLEASH THE POTENTIAL Campaign for the development of a new Student Centre. 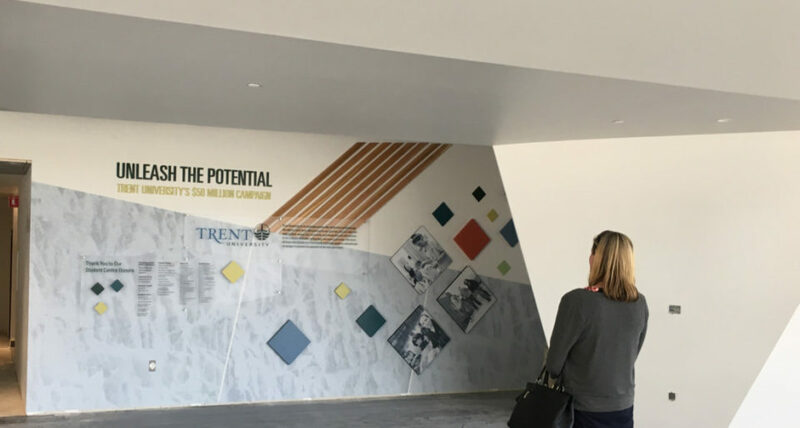 To honour Trent’s $50M campaign, qualified suppliers were invited to submit creative proposals for the design, fabrication and installation of a Donor Recognition Wall and Naming signage for the new Student Centre. 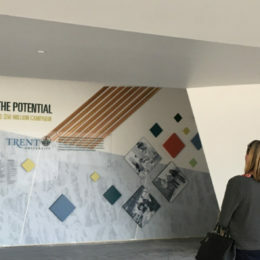 The visual parameters for the recognition design specified that it be modern, of complementary materials and esthetic, and suit the surroundings within the Student Centre. Most important, the project was to be in two phases with the first component(s) to be completed and installed no later than the week of September 25, 2017 for an event scheduled on September 29, 2017; and the second phase to be completed at the finish of the campaign in 2018/2019. Rolling the project out in two phases presented some interesting design problems. The wall was very large to begin with and slated to be painted white to match the surrounding area. The donor wall design had to take into consideration the configuration of a completed Phase 2 and yet ensure that the Phase 1 installation did not look unfinished or empty in the ensuing period. The building was also a construction site running approximately 6 to 7 weeks behind schedule but the September 29 event date was unchangeable. The donor signage design took its inspiration from the building interior and exterior as well as from the brand and marketing materials for the Campaign. The exterior of the building was poured concrete that featured an embedded textured pattern finish. Both the exterior and interior design of the building used angled and overlapping architectural features and a stark black and white interior finish to create an Escher-like, multidimensional quality. in contrast, the Western Red Cedar ceiling beams paid homage to the beauty of the natural exterior surroundings. BAS recreated the look of the exterior wall using a photographic print on vinyl and covering it with a textured laminate. This mural spanned the whole wall. Using the same angle from the exterior wall the mural started part way up the wall on the left and angled down to finish on the right creating a triangular yin/yang backdrop for the donor wall. As only half of the width was being used for the donor wall, this background unified the whole space, brought some of the outside in and gave more warmth to the installation. 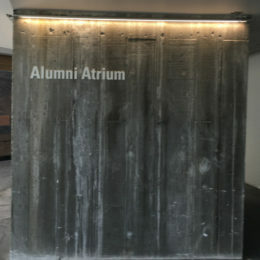 The frosted acrylic salutation and donor panel design was angular and overlapping to mimic the surrounding architecture. For contrast and counter-point we added square, dimensional colour and photo blocks of varied thickness and mounted them on a 45-degree angle. This element was taken directly from the Campaign brand guidelines and support materials. These elements added colour, interest and created a bas relief effect. We also used some of these colour blocks to fill the space where the Phase 2 Donor panel will sit. The Phase 2 panel will overlap with the existing two panels and will be mounted directly over top the colour blocks so that no removal or wall repair will be required. Dimensional letters for the header text were also direct from brand. The final donor wall element were slats of Western Red Cedar to reflect the overhead beams. The Room Recognition signs used elements to reflect and coordinate with the donor wall. Working collaboratively with the client we created a solution that worked for them, the donors, complimented the environment and was installed on time regardless of the construction delays and the hitches that resulted. 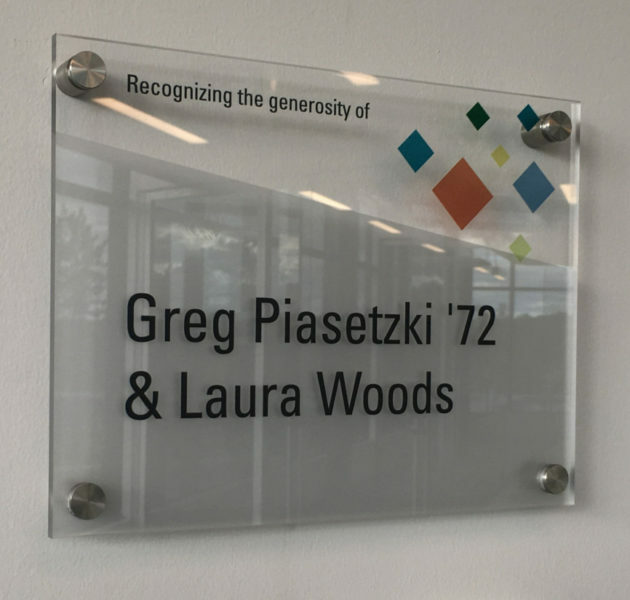 We delivered a donor recognition program that met the client’s criteria, in particular the two-phase construction, and created dynamic and innovative signage that thrilled everyone who saw it or was involved.